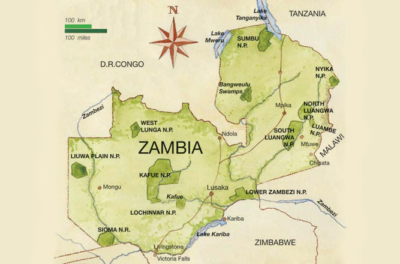 Zambia is one of the most uncontaminated countries of the region, both from a naturalistic and cultural perspective. Zambian National Parks are among the less touristic parks of all Africa, still largely wild and unexplored: for these reasons they are considered the best National Parks for game-viewing activities. In Zambia, thanks to the scarce presence of tourists and the extraordinary abundance of wildlife, you will live unforgettable experiences in direct contact with nature and really close encounters with untamed wildlife. Zambian National Parks are among the best preserved in Africa and every year they win international awards such as “Park with the lowest CO2 footprint worldwide” and “Most eco-sustainable Park in Africa”. Zambia is also the country that offers the widest range of game-viewing activities: Game-drives, walking safaris, night-drives, canoe safaris, boat safaris, etc. and is considered heaven for leopards lovers and birdwatchers, due to their abundances and ease of sighting. From a cultural standpoint, Zambian population is very open and friendly and this country offers genuine local interactions without risks or hassles. However, Zambia is also a very vast country so, unfortunately, travelling by road between National Parks and other touristic attractions can involve long transfers. Moreover, the wild conditions of its Parks and roads can really take a toll on the vehicles, so it’s always necessary to carry your sense of adventure with you. Real adventurers, people wishing to live extraordinary safari experiences. Real wildlife lovers (especially felines) who do not want a Safari “suitable for everyone”. Those who are not afraid of facing long road transfers in order to live more genuine and uncontaminated wilderness experiences. Those travellers with a sense of adventure who do not get turned down by potential hiccups along the way. People who prefer short transfers and mainly on tarmac road. Those who are afraid of travelling in areas with no phone signal. Those who cannot give up electricity not even for a day or two.